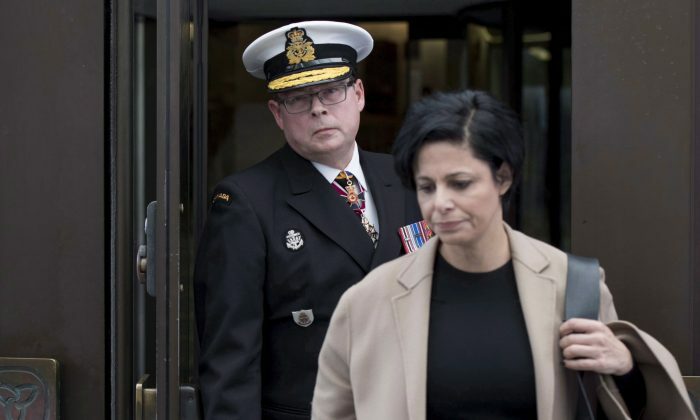 OTTAWA—A handful of supporters turned up at the Ottawa courthouse May 16 to praise Vice-Admiral Mark Norman and decry the criminal charge against him, though the suspended military officer did not personally appear in court. Norman was suspended as the military’s second-in-command in January 2017 and charged this past March with breach of trust for allegedly leaking government secrets to a Quebec shipyard. He has denied any wrongdoing. The May 16 proceeding was a routine review and followed a closed-door conference the previous day between the Crown and Norman’s defence lawyer—a conference court was told has been scheduled to resume June 27. The two sides will report back to the court July 10. Norman wasn’t present in the courtroom and was instead represented by Ottawa lawyer Owen Rees. The vice-admiral’s absence didn’t stop a handful of people from showing up at the courthouse to show their support for him, including retired naval captain Ian Paterson, who served with Norman in the Forces. “I know him as a fine man, a brilliant officer, a solid standup guy who would go to the wall for his folks,” Paterson said outside the courthouse. Norman has enjoyed significant backing from various people across the country, including more than 1,000 people who have donated a combined $125,000 to a crowdsourced fund to help cover his legal costs. Those contributors include former military officers and even some politicians such as Alberta opposition leader Jason Kenney. Many of Norman’s supporters have alleged that he is simply a casualty of a much larger war that is being quietly waged between the various shipyards involved in the federal government’s multibillion-dollar shipbuilding plan. Others have accused the Trudeau government of trying to make an example of him. “The sole agenda here is not so much Mark Norman, but there are other issues at play here,” Paterson said. “We’re here to show support for the embattled Vice-Admiral Mark Norman,” said Brandon Wallingford, who identified himself as being in car sales. The contract was to convert a civilian vessel, the MV Asterix, into a temporary resupply ship that would be leased for five years, with another five-year option, until permanent replacements could be built in Vancouver. While the plan to revisit the contract was supposed to remain secret, court documents released last year show the RCMP suspected Norman of being upset with the decision and worried the government would cancel the project. Norman was commander of the navy at the time and, according to the documents, allegedly worked with Davie to try to pressure the government to stick with the project. None of the allegations against Norman have been tested in court, and he has vowed to fight the charges. The Liberals ultimately decided to proceed with the project; the MV Asterix is now being used by the navy while Davie is currently in talks with the government for the provision of icebreakers to the Canadian Coast Guard.